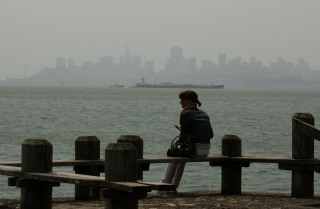 A Spare the Air alert has been issued for Wednesday in the Bay Area because of a forecast of unhealthy air quality in the region. The alert, the 15th smog-related alert issued this year by the Bay Area Air Quality Management District, is a result of hot temperatures and light winds forecasted in the region. A fire burning in the Oakland hills this afternoon is also contributing to unhealthy conditions. Air district officials say outdoor exercise should only be done in the early morning hours on Spare the Air days and that people are encouraged to avoid driving alone to work or school to limit smog. People can find out when a Spare the Air alert is in effect by visiting their website, calling (800) HELP-AIR, downloading the Spare the Air smartphone app or connecting with Spare the Air on Facebook, Twitter and YouTube.